Officer Jesse Whitten had had occasionally encountered the woman while on patrol. During one encounter Whitten's wife was at his side. The two women struck up a conversation, and several months later learned that the homeless woman specifically requested that the Whittens adopt the baby girl. Image courtesy of Santa Rosa Police Department / Facebook. 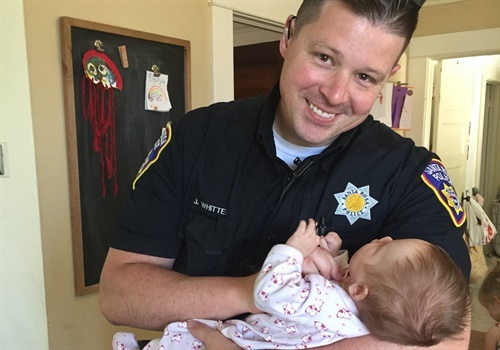 An officer with the Santa Rosa (CA) Police Department has adopted the newborn daughter of a homeless woman battling drug addiction, according to CBS News. Officer Jesse Whitten had occasionally encountered the woman while on patrol. During one encounter Whitten's wife was at his side. The two women struck up a conversation, and several months later learned that the homeless woman specifically requested that the Whittens adopt the baby girl. "Not long ago, while Ofc. Whitten was working he met a pregnant woman needing help," The department said in a Facebook Post. "She didn't ask for assistance the way a typical call for service goes, she was looking for a home and a family for her unborn baby. Ofc. Whitten, the proud father of three girls already, opened his heart and his home to this baby. And now it's official! After a moving adoption hearing, she is a part of Ofc. Whitten's family. Congratulations, Whitten family, and welcome, baby, to the SRPD family!"